The Dubliner has held the position since last June but will depart at the end of the current season. 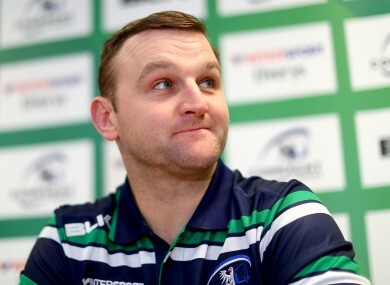 CONNACHT BACKS COACH Conor McPhillips will leave at the end of this season to link up with Pat Lam. The 36-year-old, who played for the province between 2003 and 2009, was promoted to the role last June to take over from the departing Andre Bell. However, it has been confirmed this morning that he will take up a new role as assistant coach to Lam at Bristol. “I’d like to thank Conor for all the work he’s done with Connacht over the last number of years and wish him and his family the very best in their move to England during the summer,” said Connacht CEO Willie Ruane. McPhillips added: “I have many great memories after 15 years with Connacht Rugby, as a player, performance analyst and coach. It was with Connacht that I got my first opportunity to move in to coaching and it’s been an incredibly rewarding time working as part of the backroom team. “The relationships I’ve built here and the friends I’ve made will be what I miss most but I feel the time is right to challenge myself as a coach in a new environment. Email “Connacht lose backs coach as McPhillips joins Lam at Bristol ”. Feedback on “Connacht lose backs coach as McPhillips joins Lam at Bristol ”.